SPECIAL DEAL: This is available for $699 directly from Steiner. Click store button below. DBAL-PL is rated 3.6 out of 5 by 10. Rated 2 out of 5 by Peter G from Controls are limited The device only operates with both the white light/green laser on or the IR illuminator and back light on. I'd like to turn the light off, green laser on independently. Or just run the illuminator and save the battery. Like every other device on the market. Rated 5 out of 5 by Pjames from Quality you would expect for the price. Works well anytime. 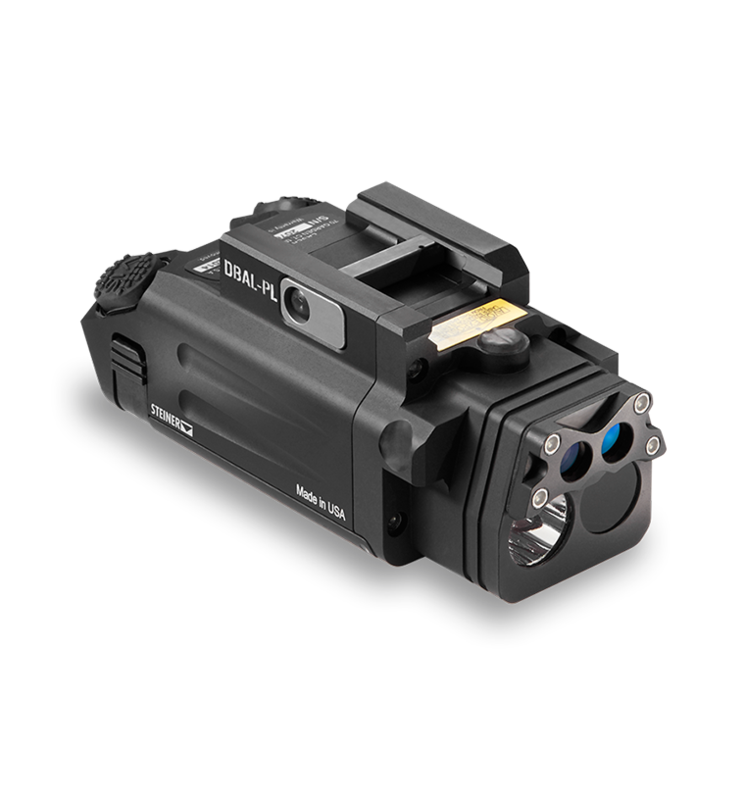 IR is bright using NVG's plus the 400 lumen light is enough to blind a person. Sits well on my M9A3. Rated 5 out of 5 by BB505 from Tactical rifle features in a handgun size package! I purchased the Steiner DBAL-PL to add to my Springfield 5.25 XDM .45, which serves as both a duty weapon and CCW weapon for me. I had chosen the DBAL-PL after I have looked at most everything on the market, and finding there wasn't anything even close to Steiner's quality or durability. I as many of Steiner's customer's am betting my life on the products I put on my weapons and I have Steiner on all of them that could mean the difference between life and death. Rated 3 out of 5 by Dond2 from Operates as Advertixed. Some Issues with Mounting Good strong IR illuminator with the IR laser. 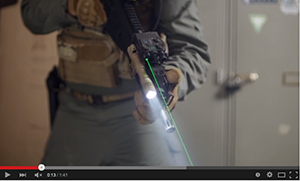 The visible flashlight is weak as compared to competitors' lumuns, and the beam can not be focused. Problem: The screws for adjusting elevation and windage are small and very tight to turn. Steiner should provide the appropriate tool for elev/wind adjustments; had to find a jeweler's screw driver. Additionally, the screw heads are made of a soft material and subject to screw head damage. Fits tightly and inline (horizontal) with the barrel on a picatinny rail, but does not align with the barrel for pistols with rail notches (e.g. Glocks). The only reason I bought this thing was due to it having a IR/VIS laser system that would fit a pistol. Rated 5 out of 5 by Warfighter from What else ya gonna do? This is a great piece of kit. Put it on your pistol, zero it, rack it a few times really hard, check your zero again, rack it again, zero again, repeat until it stops traveling from the shock of the slide racking. The visible light and laser are to be expected. Great for CQC. The IR lights work great under my Pinnacle PVS-14. The illuminator and laser show up on hogs at 25-50 yards and PID is quick and strong. I know why you're really here, though. Does it work on a rifle? Yes, I tried it on my rifle--under the bore on the end of my keymod in front of a vertical fore grip. With the fore grip right behind the laser your thumb will be right near the laser buttons, making this a reasonably quick option for rifle mounted shooting. Plus the fore grip protects it from bumps & accidental discharge. It still lights up hogs at 100 yards with IR laser and useful illumination, but I added a long range illuminator to my helmet with PID anyways. So it's no PEQ-15 at 100 yards. Mounting it to your rifle means you will want to zero it very precisely so you can shoot 100 yards, right? Well, prepare to spend about an hour playing with the zero and burn through a set of batteries. The windage and elevation screws do not travel linearly. Plus, the adjustments are so gross that you almost cannot possibly turn the screw finely enough to traverse the laser half an inch. It's almost like you have to randomly play with the screws until you accidentally get it zeroed. Rated 5 out of 5 by Commander Cody from Everything you need in a small, lightweight unit. Having a visible laser, flashlight, IR laser and IR light in such a small package is amazing. So easy to use and mounts very tight with it's built in base mount. Rated 1 out of 5 by FlyDriveRide from NOT RELIABLE NOT RELIABLE. DO NOT USE IN BATTLE. 4 times it kills batteries in 1-2 days WITHOUT USE. At first, I thought the IR was left on, so I checked with nods after shutting it off. Also, It's the heavier than any other light/laser combo I have. Will it fit my glock 19 gen 4? The DBAL PL will work with the Glock 19 Gen 4. The size of both the visible laser and IR laser dot at 750m will be about 7.2 inches. At 250m, it will be 2.4 inches. Will this fit a Sig Sauer P229R? From all appearances the battle light will fit the P229R. How would this function on a full auto M4? Hello, It will function the same. It is designed with full auto in mind. May I suggest visiting www.Steiner-defense.com? That's our global website for all our defense related products, and it has the proper contact information for you. How do you select laser only or light only? You can't: it's always the pointer and the illuminator together. Which glasses are best to use with the ir function? 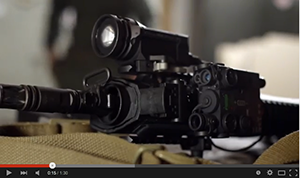 You'll need night-vision optics in order to see the infrared laser / illuminator. It is in the works, and will be out early next year.